Up to 100 outdoor units can be controlled. 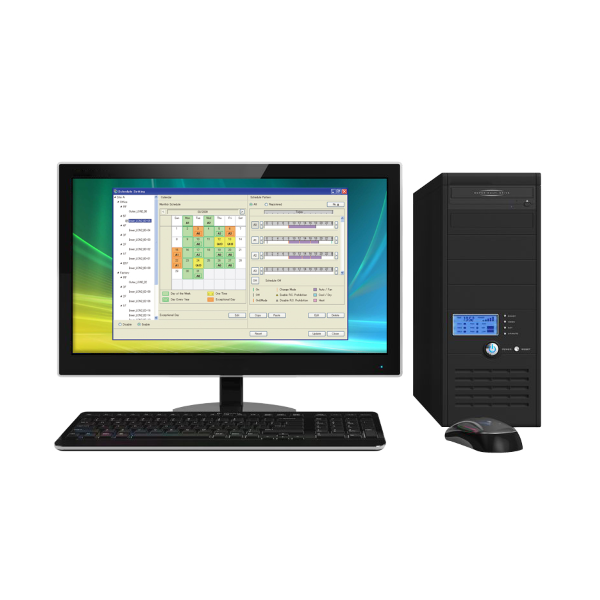 System Controller Lite has standard functions sufficient for air conditioner management in small and medium scale buildings . Up to a maximum of 1 VRF network system, 400 indoor units, and 100 outdoor units can be controlled. 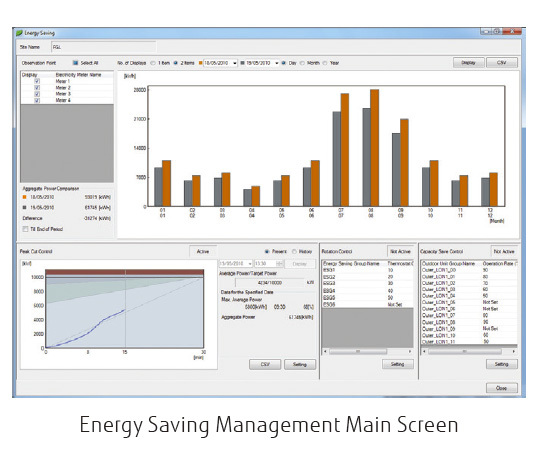 In addition to air conditioning precision control function, a variety of management software is available as an option to give customoers a wide range of choice. The property is shown visually from the perspective most suitable for operation and operated accordingly (Click & Operate). You can select from among the 4 displays of site, building, floor, or list. Indoor units can be freely grouped for simple batched control from a tree menu. Grouping by hierarchal structure, such as by section, division or department is possible. 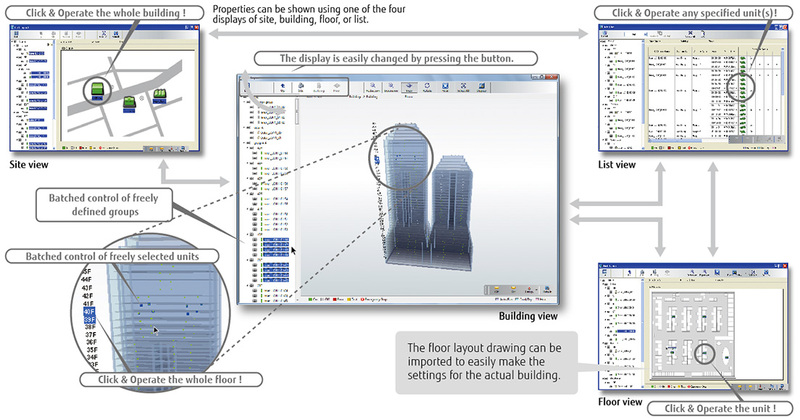 2D floor layout/3D building display are not available for System Controller Lite. 3rd party devices connected by Modbus can be controlled. When Modbus Adaptor (locally purchased) is connected to PC, the electric facilities supported by Modbus can be controlled centrally. Wasteful electricity charge by forgetting to turn off and patrol activities can be reduced in the entire building. 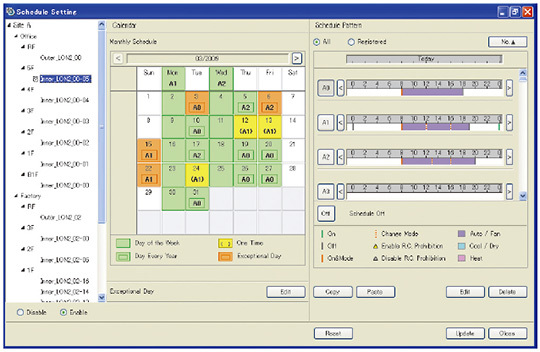 Annual schedules can be set for each remote controller group / user defined group. Start / stop, operating mode, remote controller prohibition, and temperature settings can be set up to 143 times per day at 10 minute intervals for up to 101 configurations for each remote controller group. Settings can be made for periods straddling midnight. Allows programming of special settings for holidays, including public holidays, for a complete year. Low noise operation of outdoor unit can be scheduled. This prohibits changes to the operation mode, temperature, start/ stop, etc. Error is notified with popup message, audible sound and E-mail real time when error occurs. Error for the past 1 year are logged and can be reviewed later. Displays the history of operation status and control. Imports/exports registration data, layout data, and image data. Only the administrator can make this setting. The time setting of each controller can be set in batch automatically. Suppose you want to find the power consumed by the air conditioners of each tenant from the electricity charge for each month. 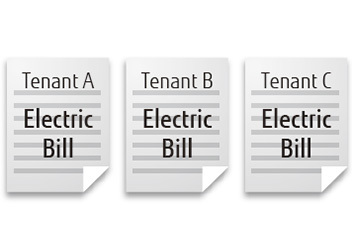 With electricity charge apportionment function, used energy apportionment ratio will be provided, calculating in detail the energy consumed by the units used by each tenant. This information is then used to calculate the charges for the electricity consumed for air conditioning by each tenant from the total electricity charges in the bill from the electric power company. (See figure at right) The detailed calculation takes into consideration such things as unused rooms and nighttime electricity charges and shows them in a charges calculation sheet. 3. 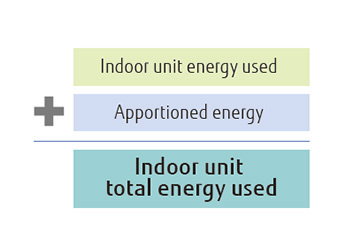 The energy used by each indoor unit and the energy apportioned by the outdoor unit are added together to calculate the total amount of energy used. The distribution ratio for energy used by each indoor unit is calculated and the electricity charges for the energy used by each indoor unit are calculated from the total electricity charges. System Controller may be used on site or remotely over various networks for remote central control. System Controller requires 2 softwares working together. 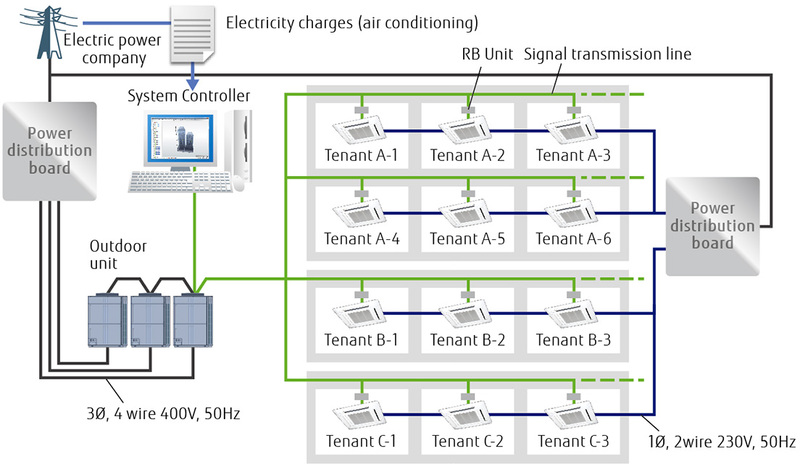 VRF Controller runs on site and communicate with VRF system. 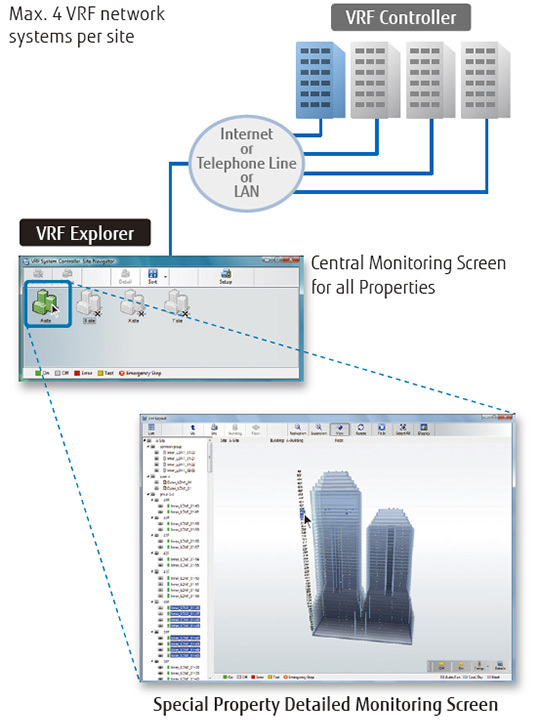 VRF Explorer runs remotely and provides user interface and communicate with the VRF Controller. 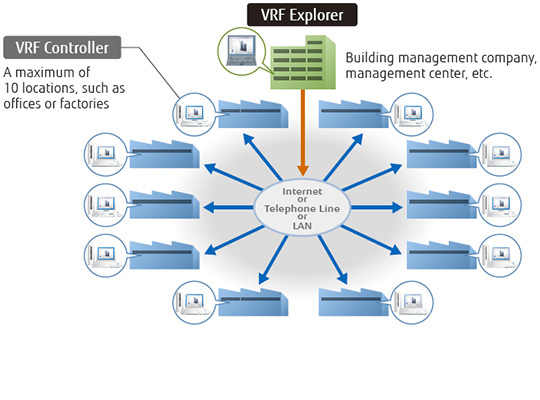 VRF Controller and VRF Explorer program may run in a single PC or in different PCs separated by network. 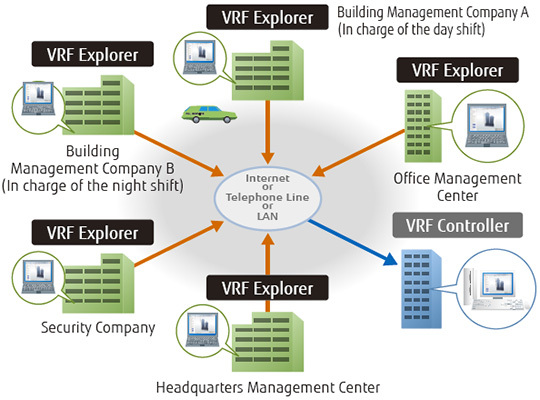 By using VRF Explorer software, one PC can perform central control of 10 VRF system sites with max. 20 buildings per site. A variety of energy saving operations can be set and managed depending on the season, weather, and time period. Excellent energy saving operation is performed while keeping users comfortable. Energy saving graph data: This graph compares the electricity consumption with the previous month and previous year to make it easy to analyse the energy saving effect. 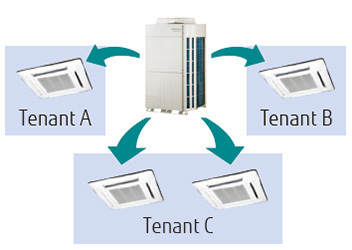 The operation of indoor units can be automatically rotated within a group in accordance with the set annual schedule to reduce power consumption while maintaining comfort. The indoor unit operation stoppage rate can be selected. A power meter is connected to detect the total power consumption while shifting the indoor unit set temperature, set the indoor unit forced thermostat off, and taking other measures to carefully control the power consumed while maintaining comfort and conducting control to maintain the target power consumption set for each time. 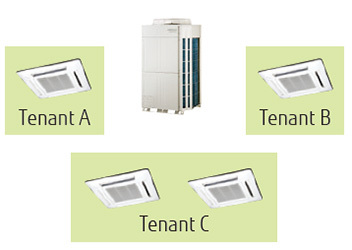 The indoor units to be controlled can be freely grouped and the control level can be set. Outdoor unit capacity save switches the outdoor unit capability upper limit to suppress power consumption during hot summers and cold winters by averaging the power saving effect of each refrigerant system. You can select from 50% or more of the capacity upper limit.